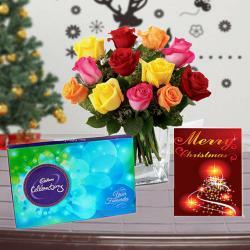 Product Consists : Bouquet of 8 Red Roses with some filliers, 1/2 Kg Black Forest Cake along with Christmas Greeting Card. When we say Black Forest Cake, the name itself makes you drool. Imagine a hamper that is packed with not only this scrumptious delicacy but also a magnificent bunch of red roses and Christmas greeting card. 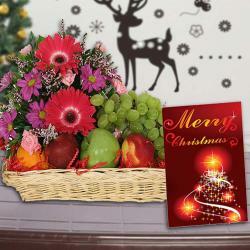 We have the hamper available here which you can choose to deliver anywhere to anyones doorsteps with just one click. 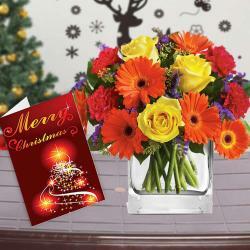 Best is to make your loved ones amazed with this happiness packed hamper on Christmas and bag loads of appreciation. 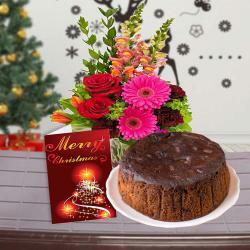 Product Consists : Bouquet of 8 Red Roses with some filliers, 1/2 Kg Black Forest Cake along with Christmas Greeting Card.